Railpictures.ca - Todd Steinman Photo: FOURTY YEARS and two days later I found myself on a mission to capture and submit a time machine photo…a possible first of it’s kind. With my wife’s help, we figured out the best possible way to shoot the present day former CASO station in Leamington. It doesn’t take much to figure out that I am paying homage to a friend, who 40 years and 2 days before me stood at the very same location. Although at that time the station was under Penn Central control, it would turn out to be another classic “Mooney shot” with a PC van parked in front. I would like to pair my photo with A.W. Mooney’s photo from 1977, and it can be viewed by clicking here. Has anyone heard of any plans for this station’s future? | Railpictures.ca – Canadian Railway Photography – photographie ferroviaire Canadienne. Copyright Notice: This image ©Todd Steinman all rights reserved. Caption: FOURTY YEARS and two days later I found myself on a mission to capture and submit a time machine photo...a possible first of it's kind. 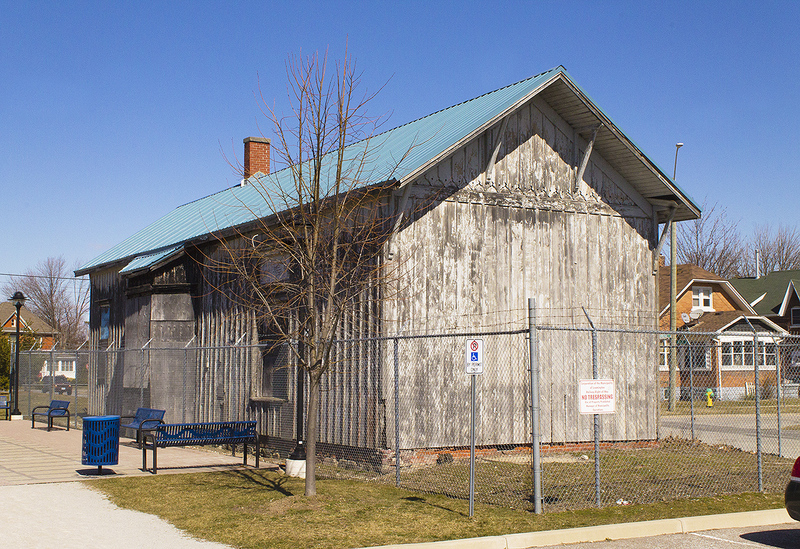 With my wife's help, we figured out the best possible way to shoot the present day former CASO station in Leamington. It doesn't take much to figure out that I am paying homage to a friend, who 40 years and 2 days before me stood at the very same location. Although at that time the station was under Penn Central control, it would turn out to be another classic "Mooney shot" with a PC van parked in front. I would like to pair my photo with A.W. Mooney's photo from 1977, and it can be viewed by clicking here. Has anyone heard of any plans for this station's future? Thank you to all of you for the accolades…it was a challenge to say the least, especially with all the trees surrounding the station being gone…and tight space with the demolition (or expansion?) of an old business in behind me. I am working on another time machine project – give it time to come into fruition – seems recently every time I go out the weather has changed from nice and sunny to blah and dreadful! Very well done, great time machine match. Wow, Todd, you nailed this one. Great work man.